One of the subtle, substantial shifts in the American way of life is that people are spending more of their food budget eating away from home. And when they do so, they tend to eat less healthy food. The Economic Research Service of the U.S. Department of Agriculture offers this graph to illustrate the shift in spending on food prepared away from home. USDA reports: "Between 1977-78 and 2005-08, U.S. consumption of food prepared away from home increased from 18 to 32 percent of total calories. Meals and snacks based on food prepared away from home contained more calories per eating occasion than those based on at-home food. Away-from-home food was also higher in nutrients that Americans overconsume (such as fat and saturated fat) and lower in nutrients that Americans underconsume (calcium, fiber, and iron)." They cite a December 2012 report, "Nutritional Quality of Food Prepared at Home and Away From Home, 1977-2008," by Biing-Hwan Lin and Joanne Guthrie. That study finds: "In the past three decades, FAH [food at home] has changed more in response to dietary guidance, becoming significantly lower in fat content and richer in calcium, whereas FAFH [food away from home] did not." Sure, it's possible to overeat dramatically at home, too. Sometimes people do sit down in front of the television with a family-sized bag of chips or a quart of ice cream. But most people wouldn't grill a burger or deep-fry chicken for lunch, not to mention the ubiquitous (and irresistable) french fries and a sugared soda. Most people don't go to a restaurant and buy an apple and a bowl of lentil soup, either. The causes of obesity are many and mixed, but it seems plausible that paying others to tempt us with food, rather than spending time ourselves to make food, is part of the pattern. The story starts a few years back when the city of Toronto decided to change over its existing streetlights to a more energy-efficient variety. Then the city decided that while doing the change-over, it would also install pedestrian countdown signals at the same time. It would start in the places where it was cheapest to retrofit, and then work across the city. This history matter for the economic analysis, because the pedestrian countdown signals were installed for reasons and in an order that had nothing to do with whether an intersection was known to be unsafe or whether previous accidents had occurred. Thus, one can reasonably compare intersections with signals to nearby intersections without, and do so before and after the signals are installed. "Our empirical analysis reveals that countdown signals resulted in about a 5 percent increase in collisions per month at the average intersection. The effect corresponds to approximately 21.5 more collisions citywide per month. The data also reveals starkly different effects for collisions involving pedestrians and those involving automobiles only. Specifically, although they reduce the number of pedestrians struck by automobiles, countdowns increase the number of collisions between automobiles. That the total number of collisions increased while collisions involving pedestrians decreased suggests that pedestrian countdown signals had a very significant effect on driver behavior. In fact, we find that collisions rose largely because of an increase in tailgating among drivers, a finding that implies drivers who know exactly when traffic lights will change behave more aggressively." In short, the pedestrian countdown signals were good for pedestrians. But some of the drivers were watching the signals, trying to squeeze through before the light changed, and rear-ending other cars. is that while countdowns can improve safety in historically dangerous cities, they may be detrimental to safety in historically safe ones." Also, instead of having a pedestrian countdown signal that is visible to cars, it might make more sense to have a verbal countdown that could only be heard by pedestrians. The broader lesson is that it's common to assume, without a lot of thought, that more information shared more broadly will make everyone better off. But the case of Toronto's countdown signals is an example of where making information available only to some (pedestrians) and not to others (drivers) is socially beneficial. Another example involves the story of Inspector Sands in the title of the article. Kapoor and Magesan write: "Few know who Inspector Sands is, and no one has ever met him. This is for good reason. Theater companies in the United Kingdom are believed to use the code name “Inspector Sands” in order to alert ushers to pending emergencies, such as fires and bomb threats, without inciting panic among their patrons. When theater staff learn of a fire, for example, they page Inspector Sands to the fire’s location. When ushers arrive they can put out the fire or help to evacuate the premises in a discrete and orderly manner. By ensuring the threat remains hidden from the public eye, the code name allows ushers to complete the tasks without having to deal with panicked crowds." Thus, Inspector Sands is a case, like pedestrian countdown signals, where information is revealed in a limited way to some, because revealing it to all would risk causing harm. Full disclosure: The AEJ:EP is published by the American Economic Association, which also publishes the Journal of Economic Perspectives, where I work as Managing Editor. The United Nations declared 2005 the Year of Microcredit. In 2006, the Nobel Peace Prize was awarded to Mohammad Yunus and the Grameen Bank in Bangladesh. But more recently, the Bangladeshi government pressured Yunus out of the Grameen Bank, has tried to prosecute him for tax fraud on what looks like frail evidence, and has proposed dismantling Grameen into 19 separate banks. A scandal erupted in India, where a microfinance lender based in Andhra Pradesh was accused of driving over 50 borrowers to commit suicide by shaming and threatening when they could not repay their small loans on schedule. 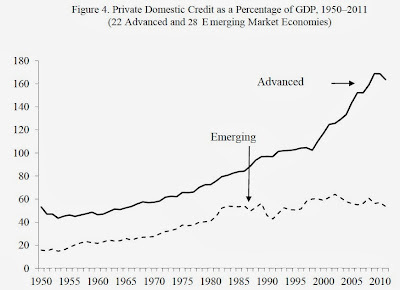 David Roodman sorts out the evidence on the current state of microfinance in "Armageddon or Adolescence? Making Sense of Microfinance’s Recent Travails," written as Center for Global Development Policy Paper 35 (January 2014). The first fact to recognize is that microfinance has expanded a great deal, reaching nearly $80 billion and with a considerable presence all around the world. 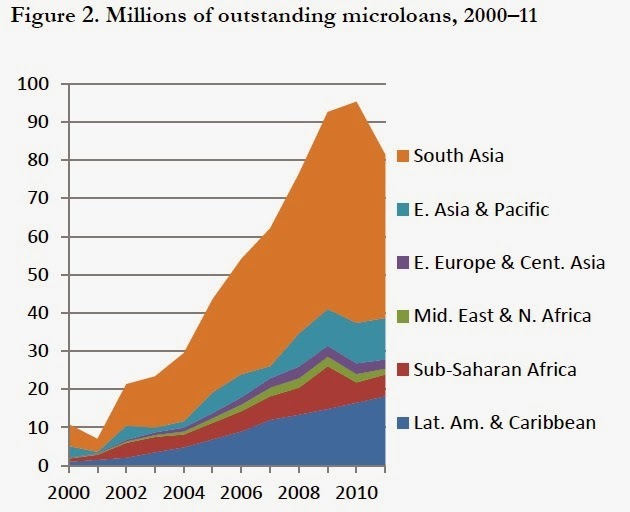 The number of microloans outstanding topped 90 million in 2010, before declining in 2011 as a result of broad economic turmoil in the world economy and the fact that microfinance dried up in several regions and countries. Roodman goes into some detail about the financial condition of microfinance institutions. Short story: they often benefit from being able to raise capital very cheaply, through donors or loans to them made at below-market interest rates. However, with a few notable exceptions like the microfinance institutions in Andhra Pradesh, they are then able to operate in a reasonably self-sufficient way, with repayments of previous loans funding new loans. Moreover, a number of microfinance institutions are migrating away from just giving loans, and are starting to provide a fuller range of financial services to those with low and unstable incomes, including setting up bank deposits and facilitating domestic and international money transfers. Roodman also reviews the evidence that the benefits of microfinance have been misunderstood and misstated. The common belief is that microfinance helps low-income people start businesses, which can then lift them out of poverty. But the best and most recent economic studies find that while microfinance does help start some businesses, the effect on poverty for those receiving the small loans is negligible. Of course, future studies may come up with different results. But for now, the strongest benefits from microfinance seem to be that it enables those with very low incomes to have greater control over their lives. They can borrow to buy a durable good. They can have a place where their savings are secure, or where they can transfer money. Moreover, from a social point of view, microfinance organizations are developing the organizational and managerial capabilities to operate like standard banks. "Microfinance has been growing for 35 years and now reaches upwards of 100 million people, who cannot all be wrong in their judgments about the utility of microfinance. Moreover, most of them are served by institutions that are nearly or completely self-sufficient in financial terms; these MFIs [microfinance institutions] do not depend greatly on outside subsidies ... Because of the vicissitudes of poverty, poor people need financial services more than the rich. Their financial options will always be inferior—that’s part of being poor—and microfinance offers additional options with distinctive strengths and weaknesses. deliver a variety of inherently useful services on a large scale. Nevertheless, the recent travails are signs that something is wrong in the industry. What is wrong is, ironically, what was once so right about the industry: it largely bypassed governments in favor of an experimental, bottom-up approach to institution building. The industry got so good at building institutions and injecting funds into them that it often forgot that a durable financial system consists of more than retail institutions and their investors. The narrow focus became a widening problem as microfinance grew. ... To mature, the industry and its supporters should recognize the imbalance it has created. Where possible, they should work to strengthen institutions of moderation such as credit bureaus and regulators. Accepting that such institutions will often be weak, they should err on the side of investing less. In microfinance funding, less is sometimes more." Smoking —50 Years of Progress." Most of the nearly 1,000-page report (think before you hit "Print All Pages" on this one!) focuses on health effects of tobacco use. Basic message: Tobacco use is much more hazardous than we thought in 1964, and even more hazardous than we thought 10 or 20 years ago. But round about p. 700 of the report it offers a few chapters on tobacco use and tobacco policy, which is where the economic issues begin to appear explicitly. 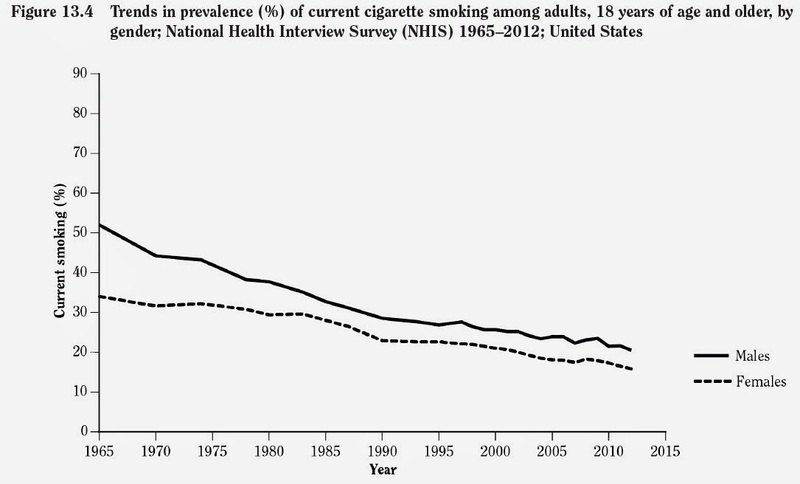 As a starting point, here are long-term trends for tobacco consumption in the United States. The first graph shows that per capita consumption of tobacco--that is, total use divided by total population--has fallen from 12 pounds per person per year in the 1950s to about 4 pounds per person per year at present. This figure shows the share of the adult population that currently smokes cigarettes. More than half of men and about one-third of women smoked in 1964; now, it's around 20% for women and a little higher for men. between $289–332.5 billion, including $132.5–175.9 billion for direct medical care of adults, $151 billion for lost productivity due to premature death estimated from 2005–2009, and $5.6 billion (in 2006) for lost productivity due to exposure to secondhand smoke." Since the 1964 re[pt, a variety of anti-tobacco policies have been enacted: taxes on cigarettes, lawsuits against tobacco companies, warning labels, anti-smoking media campaigns, limits on advertising cigarettes, support for quitting, and rules that limit exposure to secondhand smoke in public places. What difference has it all made and where do we stand? The January 8, 2014, issue of the Journal of the American Medical Association (JAMA) has a useful set of articles reviewing the evidence and arguments (which can be read on-line with a slightly clunky browser). In "Tobacco Control and the Reduction in Smoking-Related Premature Deaths in the United States, 1964-2012," Theodore R. Holford, Rafael Meza, Kenneth E.Warner, Clare Meernik, Jihyoun Jeon, Suresh H. Moolgavkar, David T. Levy take on the task of estimating how much smoking in the U.S. has been reduced as a result of the anti-smoking efforts. They write (and for readability I have deleted (bracketed information about the statistical confidence intervals from this description): "In 1964-2012, an estimated 17.7 million deaths were related to smoking, an estimated 8.0 million fewer premature smoking-related deaths than what would have occurred under the alternatives and thus associated with tobacco control (5.3 million men and 2.7 million women). This resulted in an estimated 157 million year of life saved, a mean of 19.6 years for each beneficiary (111 million for men, 46 million for women). During this time, estimated life expectancy at age 40 years increased 7.8 years for men and 5.4 years for women, of which tobacco control is associated with 2.3 years (30%) of the increase for men and 1.6 years (29%) for women." What is the appropriate public policy with regard to tobacco? The Surgeon General's report writes: "This nation must create a society free of tobacco-related death and disease." In a note before the report, the Secretary of Health and Human Services Kathleen Sibelius writes: "I believe that we can make the next generation tobacco-free." I'm fine with all sorts of anti-tobacco policies, but I confess that I do not find the spirit of prohibition any more attractive when applied to tobacco than when it was applied to alcohol. People eat and drink all sorts of things that can cause ill-health, especially if taken to extremes. People also fail to exercise or to take multivitamins or small amounts of aspirin that would improve their health. But the usual starting point for economic analysis is that a free society is better off when people make their own choices. There are several potential reasons for reaching a different conclusion. For example, one possible reason is that people lack information in making their decisions, and so the government should assure that such information is provided. After 50 years of warnings, and drilling the health hazards of smoking into schoolchildren everywhere, I find it difficult to believe that many people are ignorant of the health risks. Indeed, cigarettes were referred to as "coffin nails" as far back as the 19th century. Sure, it's possible to make the health warnings more explicit, even grotesque, but at some point such efforts stop being about "information," and are essentially propaganda. Another possible reason for anti-smoking policy is "externalities"--that is, smoking imposes costs on others. But when smoking reduces the productivity and wages of a smoker, the smoker bears that cost directly. When smoking shortens life expectancy, the smoker bears that cost directly, too. Indeed, even when smoking causes sicknesses that lead to expenditures on health care costs, the grim truth (as economists and demographers are willing to note off the record), is that shorter life expectancies mean less government spending for programs like Social Security and Medicare. In addition, many of those who die from smoking-induced strokes or heart disease impose relatively low costs on the health care system. The "externalities" argument is a strong justification for reducing unwanted exposure to second-hand smoke. But given that we already have taxes on tobacco products that can be viewed as helping to offset the health care costs imposed by these programs, it's not clear how much more policy intervention can be justified by this argument. The final reason for anti-smoking policy is sometimes called "internalities"--that is, people would like to quit smoking, but many of them find themselves unable to do so, and so they need some public policy help to avoid imposing costs on themselves. The Surgeon General report states that "68.9% of current adult daily smokers in that year  were interested in quitting smoking. ... In 2012, the overall quit ratio (i.e., the percentage of ever smokers who had quit smoking) among U.S. adults was 55.1%, which means that in that year there were more former smokers than there were current smokers in the United States." In this spirit, the panoply of anti-smoking policies can be views as helping people who want to quit--or perhaps would prefer never to start the habit--to find the extra energy and incentive that they need to do so. But the "internalities" argument should not be pushed so far as to conclude that everyone who smokes should always wants to quit. Some smokers will prefer to follow Mark Twain's old advice, related to his own prodigious cigar smoking, "If you can't reach 70 by a comfortable road, don't go." The evidence on cigarette taxes and the rate of smoking is compelling. The Surgeon General writes (citations omitted): "In 2012, the federal tax rate was $1.01 per pack and the mean state tax rate was $1.53 per pack. 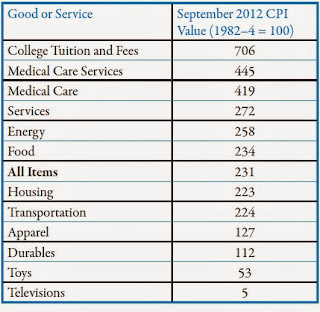 The average price, nationally, for a pack of cigarettes in 2012 was $6.00." Here's a figure showing the real-inflation adjusted price of a pack of cigarettes, compared with consumption of cigarettes. 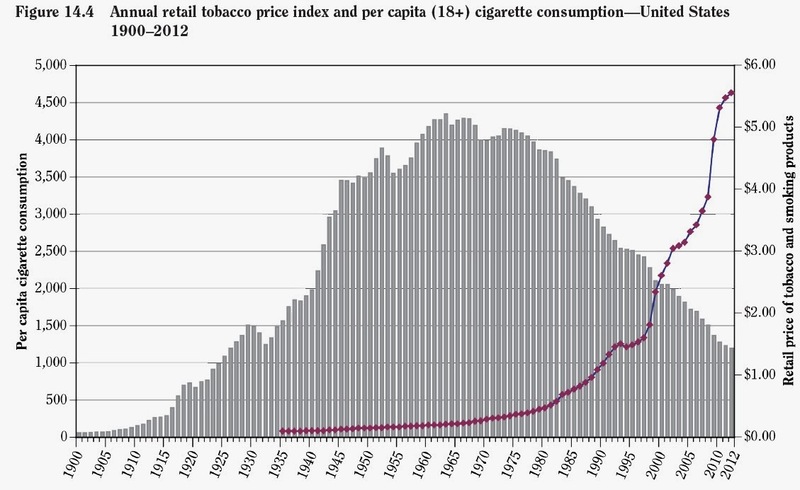 It's intriguing to note that cigarette consumption has fallen as the after-tax price has risen. The Surgeon General's report also discusses the range of other anti-smoking policies. But the report touches only lightly on the most intriguing current method for reducing smoking: that is, electronic cigarettes that provide a dose of nicotine without producing smoke. That January 8, 2014, issue of JAMA includes an article by David B. Abrams called "Promise and Peril of e-Cigarettes: Can Disruptive Technology Make Cigarettes Obsolete?" Abrams writes that e-cigarette revenues have doubled each year since 2008, and have now reached $2 billion. There is some preliminary evidence that e-cigarettes might help people to quit smoking altogether, but even if this fails to hold up in further studies, e-cigarettes pose a vastly lower health risk than smoking tobacco, both to the user and to anyone around them. Abrams points out that e-cigarettes create a tension between those who believe in "abstinence" and those who believe in "harm reduction." My own general view is that while it's fine in many famioly and educational contexts to suggest that abstinence would be a sensible individual decision, public policy should focus less on enforcing abstinence and more on offering opportunities for harm reduction. I've never smoked tobacco in any form--cigarette, cigar, pipe--and I have no particular intention of giving it a try. But those of us who are regular consumers of caffeine, like me, should probably hesitate before we get too strident about those who prefer to consume nicotine. To its credit, the U.S. Office of Management and Budget keeps a list of "High-Error Programs," which is roughly defined programs that pay out $750 million or more improperly. Here's the list for 2012. In thinking about where the problem is most severe, the last two columns are where to focus. 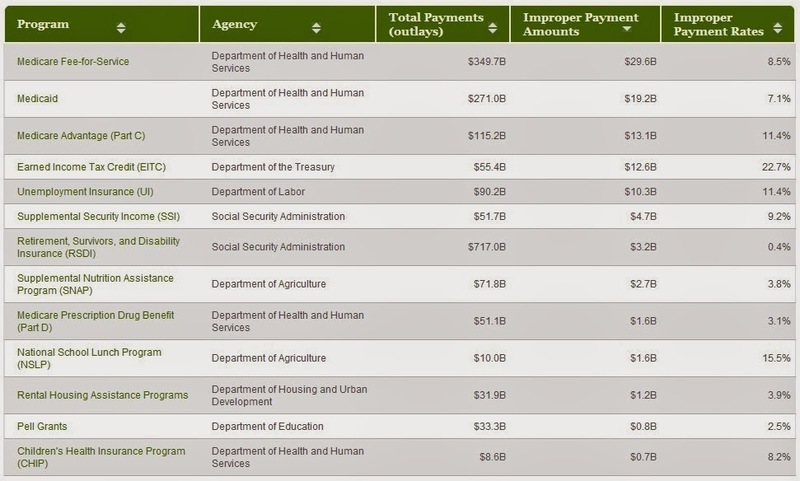 The last column on the right shows what proportion of payments are made in error; the second column on the right shows the amount of the improper payments. Again, these numbers are official estimates from the U.S. government, not wild-eyed claims by opponents of these programs. Even for a flinty-hearted economist like myself, some of these examples bother me more than others. For example, the school lunch program has a fairly high 15.5% rate of improper payments, but it seems to me unlikely that anyone in school cafeterias across the country is getting rich off these payments. My guess is that many of these improper payments are to children whose families are only borderline ineligible for the programs. And providing food in schools that serve low-income populations is a reasonable policy goal. Or the Social Security programs that handle Retirement, Survivor's and Disability Insurance make the list because there is a low error rate (0.4%) on a very large amount of total spending ($717 billion). But some of the other categories are more troubling. It's troubling that the top three programs on the list all involve health care spending through Medicare and Medicaid, and total $61.9 billion in improper payments. As the US is struggling to implement a new system of health insurance under the Affordable Care Act, with heavy and occasionally capricious government oversight, the table suggest that the federal government is not well-situated to oversee day-to-day medical interactions and decisions. While I'm a fan of the Earned Income Tax Credit, the 22.4% rate of improper payments is nonetheless striking and disheartening. As I discussed here, the problem seems to be a mixture of people whose economic and family lives are often in flux and who often have no particular facility for filling out detailed paperwork and records, combined with a complex set of government rules. Throw some opportunistic fraud into the mixture as well, and the overpayment rate gets high. Once the federal government sends out the checks, the improper payments are rarely recovered. The website states optimistically that recovery of improper payments was up to $4 billion over the previous three years, thanks mostly to efforts in Medicare. But with the improper payments running at $100 billion per year on the government's own estimates, this hardly seems a reason to toss the confetti. One signal for whether the U.S. economy is ready for a more robust recovery is the extent to which the financial position of households has rebounded. 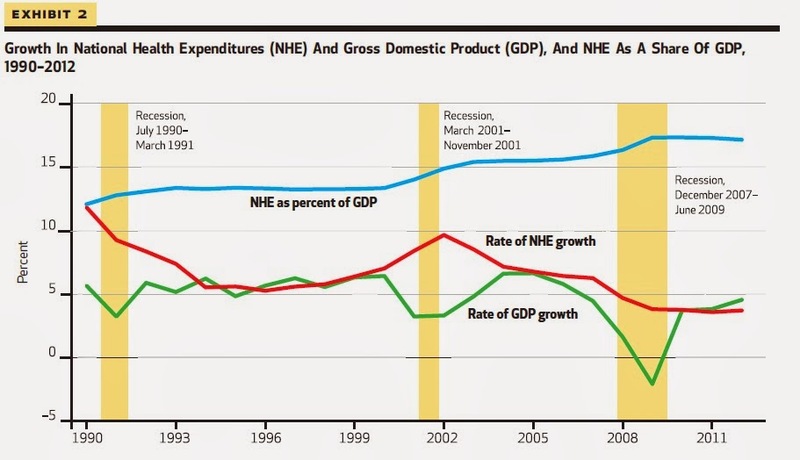 Here are some illustrative figures, taken from the January 2014 issue of Economic Trends from the Cleveland Fed. O.Emre Ergungor and Daniel Kolliner write about "Household Economic Conditions." Here's a figure showing the movements in household wealth since 2000. 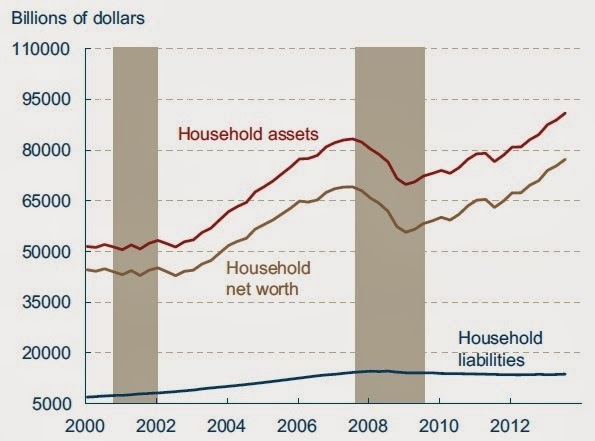 Household assets and net worth have now rebounded and surpassed their pre-recession highs. 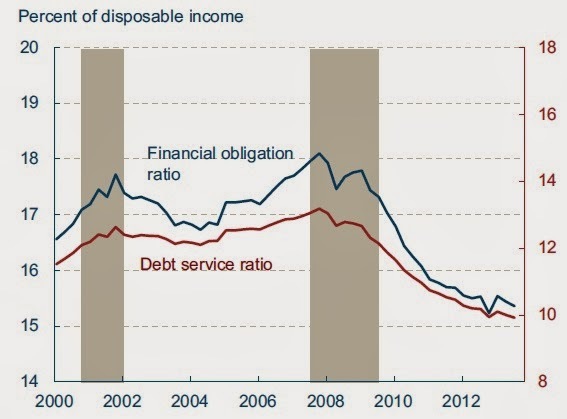 Part of what's happening here is that households have trimmed back on many of their debts. This figure show the change in outstanding debt in various categories over the previous four quarters. During the housing bubble, for example, mortgage debt was growing at more than 10% per year. 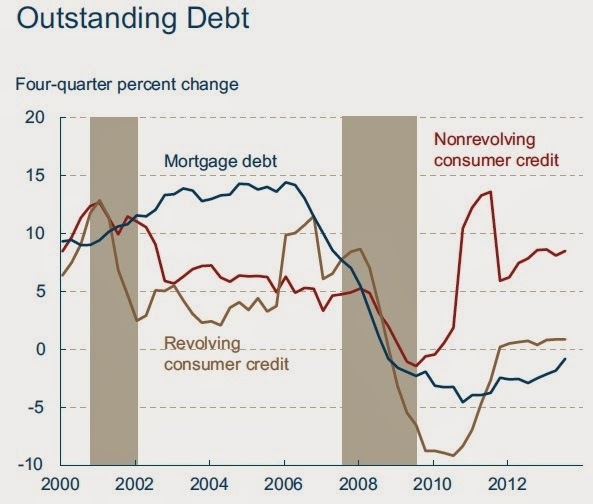 But household mortgage debt has been contracting (that is, negative growth) since about 2008. The authors write: "Revolving consumer credit balances plummeted in 2008 and are currently barely higher than their level in the third quarter of 2012. Outstanding home mortgage debt is still contracting due to record write-off s and reduced demand for homes in previous years. Nonrevolving consumer credit, which consists of secured and unsecured credit for student loans, automobiles, durable goods, and other purposes, is the only credit category that shows some sign of life. It is currently 8.5 percent above year-ago levels. Note, however, that the student loan component is entirely driven by federal government loans to students and does not reflect private market activity." The combination of lower household debts and sustained low interest rates means that households are spending less on debt service. They write: "The financial obligation ratio, which expresses household liabilities, such as credit card payments, mortgage payments, home property taxes, and rent payments, as a percentage of disposable income, is at its lowest level since the third quarter of 1981." 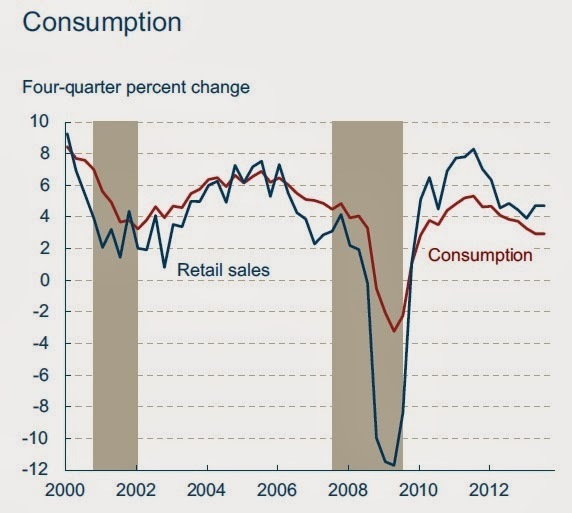 A result of these changes is that retail sales and consumption overall, if not yet back to healthy growth rates, are at least solidly back in positive growth after their nosedive during the Great Recession. Of course, the unemployment rate remains high, as do the number of long-term unemployed and concerns over whether some workers are not being counted as unemployed because they have become too discouraged to look for work. But noting that the economy is improving is not to make the claim that it's already a bright sunshiny day. One final pattern caught my eye in an article on "Employee Compensation Costs during the Recovery," by Joel Elvery. He points out that the patterns of wages and of benefits have been diverging in recent years. 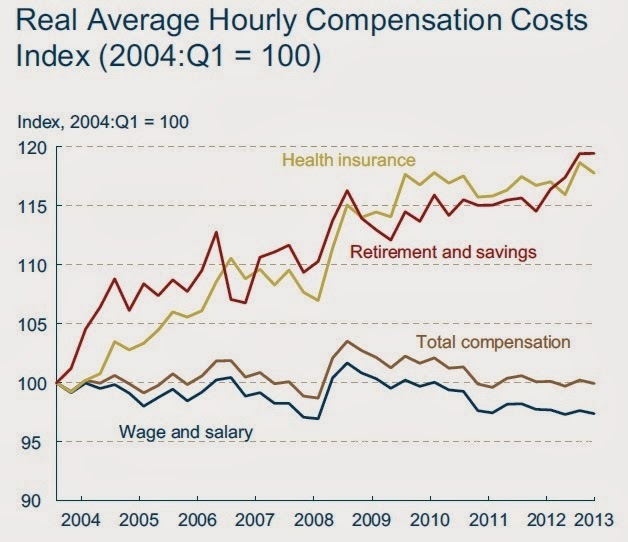 This figure needs to be interpreted with care, because hourly compensation costs are affected by which workers have jobs. Thus, the rise in wages and salary around 2008 is not because lots of workers saw a big raise, but instead because lower-paid workers were more likely to become unemployed, and so the average wage and salary for those with jobs was higher as a result. But the overall pattern here is clear enough. Over the last decade, wages and salaries have been pretty flat, but the costs to employers of benefits like retirement and savings accounts, as well as health insurance, have been rising. As I've written before on this blog, health care costs (along with other benefits) have been eating your pay raise. Back in 1986, 64% of the voters of California enacted Proposition 65: The Safe Drinking Water and Toxic Enforcement Act. Who could be against it? Well, I was working as an editorial writer for the San Jose Mercury News at the time, and I wrote the paper's editorial explaining why the law was misguided. issued by a typical California hotel." "The warnings include: mercury in seafood; secondhand tobacco smoke; cleaning supplies and related activities; on-site construction; furnishings, hardware, and electrical components, including furniture, window treatment, locks, keys, electrical equipment, and carpeting; personal hygiene and medical supplies, including soaps, shampoos, and first aid supplies; hotel water supply systems, including faucets and other plumbing components; combustion sources, including automobile engines, gas stoves, fireplaces, and candles; office and art supplies and equipment, including carbonless paper, marking pens, copier machine chemicals, glues, crayons, and paints; landscaping supplies and pesticide treatment, including fertilizers, soil amendments, and pesticides; food and beverage service, including broiled and barbecued foods; transportation-related exposures, including motor fuels and engine exhaust; equipment and facility maintenance, including motor oil changes, carburetor cleaning, battery replacement, and facility repairs; retail sales; and recreation facilities, swimming pools, hot tubs and beaches,including beach sand (which can contain quartz sand, a form of carcinogenic crystalline silica)." As the last example makes clear, the Prop. 65 rules don't distinguish between manufactured products and naturally-occurring carcinogens. Certain foods like bread and chicken have trace amounts of chemicals that, if fed to lab rats in large doses, can cause cancer. So restaurants need to post Prop. 65 signs, too. Unsurprisingly, when Marlow dredges through the statistics at some length, there isn't any clear evidence that Prop. 65 affected cancer rates. "The California Appellate Court in 2006 noted that bringing a Proposition 65 bounty-hunter action is so “absurdly easy” that the attorneys’ fees paid by defendants to avoid litigation are “objectively unconscionable.” ... Over 2000–2011, there were 2,381 settlements. in 2011 alone, there were 338 settlements—the highest number of any year in this period. no information exists on how many settlements occurred prior to the 1999 amendments. Total settlement amounts over the 2000–2011 time frame totaled nearly $180 million (in 2011 dollars). that figure underestimates total costs to firms because it does not include legal and expert witness costs of defendants or court costs for cases that went to trial. Plaintiff s receive most settlement dollars in the forms of attorney fees and “other” payments made directly to organizations bringing suits or other organizations designated by filing organizations, with the California government receiving less than 15 percent of settlement costs in recent years." I took some flak back in 1986 for opposing Prop. 65. But requiring a multitude of vague warnings, combined with a license to sue, is not sensible public policy. "On August 5, 2013, the first hamburger grown from stem cells in a laboratory, and not in a cow, was served in London. ... If this technology continues to evolve and is deployed at scale, it will have significant social, cultural, environmental, and economic implications." Carolyn Mattick and Brad Allenby launch the discussion in "The Future of Meat," in the Fall 2013 Issues in Science and Technology. To be sure, the technology isn't quite ready for fast food. "From an economic perspective, cultured meat is still an experimental technology. The first in vitro burger reportedly cost about $335,000 to produce and was made by possible by financial support from Google cofounder Sergey Brin." Mattick and Allenby discuss a number of technological challenges. Of course, the pushback against this technology is likely to be strong at first, especially from agricultural interests and from some consumers. But technology can sometimes overcome nostalgia and alter our sense of the possible. For example, will environmentalists who view climate change as the overwhelmingly important issue of our time be willing to support production of cultured meat? Will animal rights activists who protest "factory farming" support cultured meat? Mattick and Allenby report that culturing skin is easier than culturing meat, so leather from cultured skill may be available at reasonable cost in a few years: "The Missouri firm Modern Meadow has an even shorter time horizon for a similar tissue engineering process aimed at producing leather (making cultured skin is simpler than producing meat). It has said in a Txchnologist article reprinted in Scientific American in 2013 that bioengineered leather products will be commercially available by about 2017." Generational change alters what consumers view as acceptable, too. Mattick and Allenby write: "Food is a culturally charged domain, and the technological evolution of meat may well outpace cultural acceptance of radically new food production technology. Nonetheless, people may eventually look at a T-bone steak with the nostalgia they feel for the Apple IIe: It was an important contributor to technological evolution and economic productivity, but no one would choose it over an iPad." Food for thought, there. 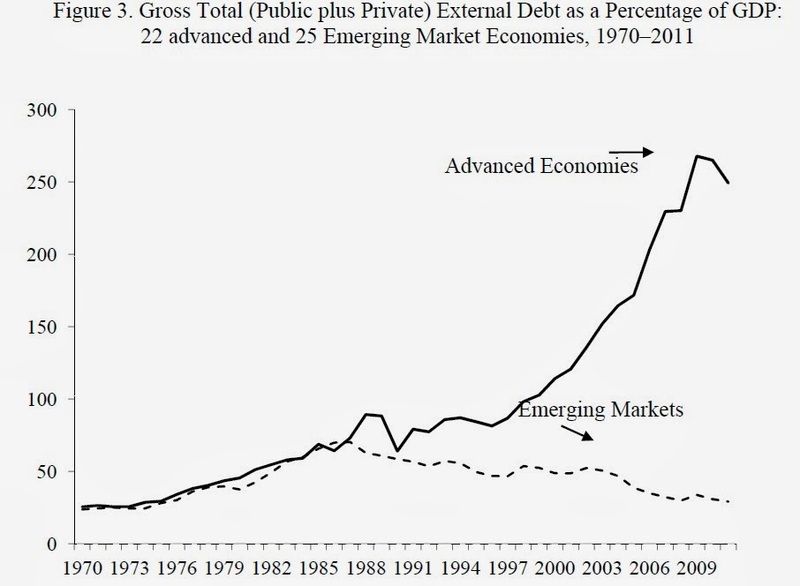 The U.S. GDP is now about 22% of the global total, and very likely to keep declining in the next few decades. But policy discussions in the U.S. often don't really come to grips with the fact that the U.S. has limited power in this globalizing economy. Here are a few examples. Concerning climate change policy: Here's a recent report from Reuters on China's announcements about expanding coal production. "China approved the construction of more than 100 million tonnes of new coal production capacity in 2013 - six times more than a year earlier and equal to 10 percent of U.S. annual usage - flying in the face of plans to tackle choking air pollution. The scale of the increase, which only includes major mines, reflects Beijing's aim to put 860 million tonnes of new coal production capacity into operation over the five years to 2015, more than the entire annual output of India." While U.S. can (and should) argue about appropriate policies to address carbon emissions, choices made in the U.S. and Europe will not be the primary determinants of future carbon emissions. Concerning corporate taxation: American citizens and politicians can argue all they want about what it is "fair" for corporations to pay in taxes, but in an economy with global supply chains and rising trade, corporations will inevitably have greater power to shift operations and use accounting to move profits between jurisdictions. Signing some international agreements about corporate taxation won't change this basic fact. If you want to tax high-income people, then it makes more sense to focus on their tax rates, rather than trying to tax corporation. Concerning the directions of future technology growth: Here in America we like to have arguments over what kind of research on, say, genetic issues or using human tissue should be acceptable. 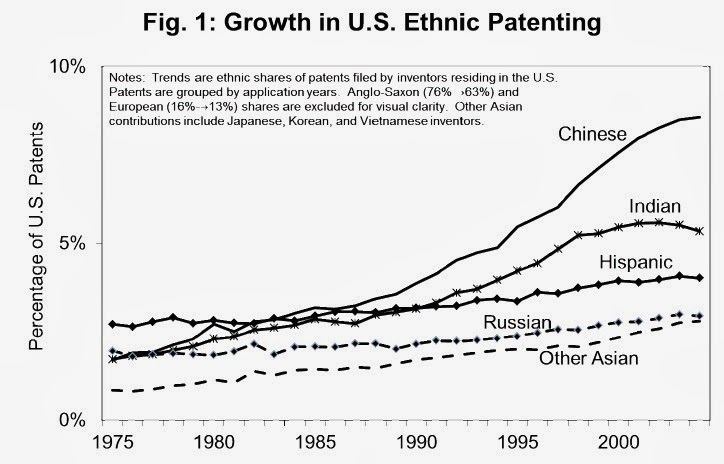 But the U.S. share of global R&D fell from 38% in 1999 to 32% by 2009. China has now outstripped Japan for second place in global R&D spending, and China's R&D spending is similar to that of Germany, France, and Italy combined. A report just published in the New England Journal of Medicine notes that U.S. biomedical R&D spending dropped from 2007-2010, while the world total is rising. 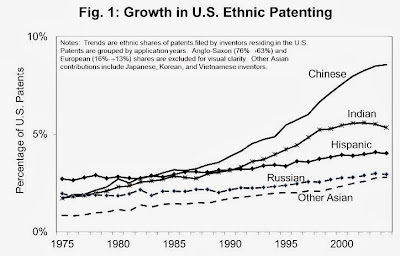 In the past, the rest of the world sometimes complained that global R&D was dominated by U.S. priorities. This complaint will be less true in the future. Concerning blockbuster movies: The rest of the world used to complain, with some justice, that they were forcefed a diet of mass entertainment based first and foremost on the desires of U.S. customers. But now blockbuster movies are made with the global market in mind. Superheroes, cartoons, robots, global crime, and natural disaster play well everywhere. Concerning globalization itself: When the subject of trade agreements comes up, like the Trans-Pacific Partnership, Transatlantic Trade and Investment Partnership, and Trade in Services Agreement, the tone of the discussion often seems to imply that U.S. policymakers are deciding on the future of globalization. But they are not. Globalization is speeding ahead without any permission from them, based on advances in transportation, information, and communications technology, along with actions by other countries. Trade policy is only trying to shape the direction of globalization a bit, and to negotiate around the margins some of the terms under which globalization will proceed. Just to be clear, the U.S. economy is not becoming a economic minnow like Belize or Burundi. 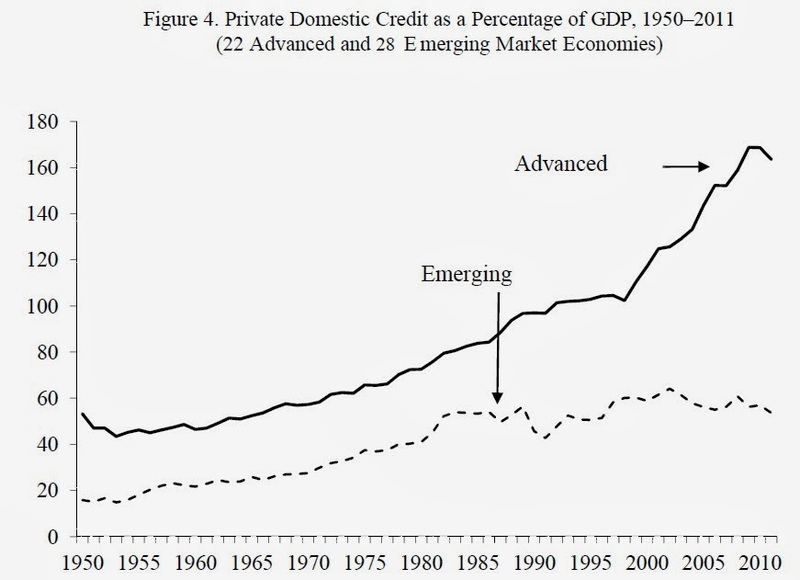 But 65 years ago, as the high-income countries climbed out of the wreckage left by World War II and today's emerging economies had not yet engaged in the global economy, the U.S. economy had an extraordinary time of dominance. 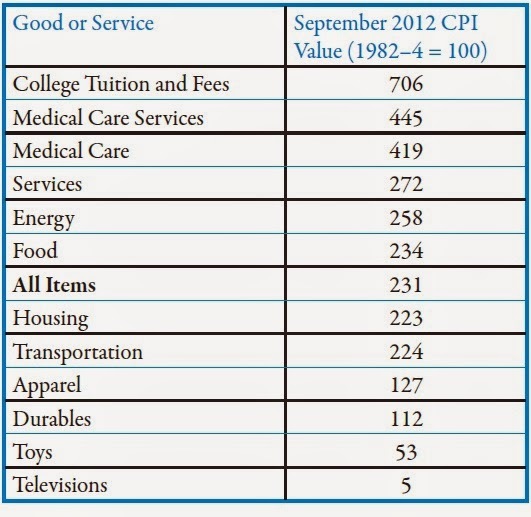 For a time in the 1960s, it was common to hear that the planned economy of the USSR would outstrip the U.S. economy. 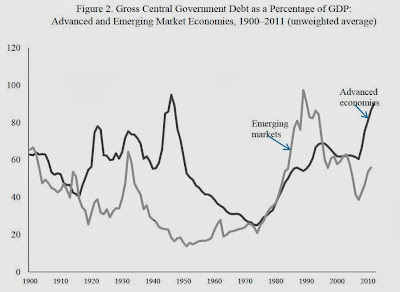 In the 1970s and into the 1980, Japan was going to rule the world economy. Around 2000 and the launch of the euro, there was talk about the economic rise of the European Union. But now, we are seeing the rise of a multipolar and distributed world economy, with faster growth happening in the emerging economies, but with stronger linkages of trade and global supply chains reaching across the world economy. The U.S. can certainly be an active and leading participant in shaping the world's economic future. But neither the U.S., nor some combination of high-income countries around the world, has the power to dictate what configurations will emerge. Back in 2006, the Nobel Peace Prize was awarded to Muhammad Yunus and Grameen Bank "for their efforts to create economic and social development from below." With a few exceptions, like the award to Norman Borlaug for his work on the "Green Revolution" back in 1970, The award is usually given for efforts involving human rights, democracy, international affairs, and peace. I know I wasn't alone among economists in appreciating the recognition that improvements in economic life could contribute to peace, too. But what's up with Yunus and Grameen Bank today? Here's an interview that Sophie Shevarnadze recently conducted with Yunus for the World Public Forum. The tone of the interview can be inferred from the title: "Bangladesh Govt Destroying System That Saved Millions from Poverty." "As I said, it’s very painful because it was done in a kind of inconsiderate way, because we were not taken as a government bank, government applied the government bank rule onto Grameen Bank, saying that we‘re not following the Grameen Bank’s rules of retirement. We said this is a bank owned by poor women. We have our own rules, our law allows that, so this restriction about age limit doesn’t apply to Grameen Bank and our board is very clear on that. But in any case I was asked to resign, so I resigned and came out of it." "Well, this all came for political reasons; there is no complete issue about that. I mean, by dividing up and splitting up the Grameen Bank in 19 pieces only – you’ll destroy the bank. If somebody wants to destroy the bank, that’s the best way to do this – cut it up, chop it off and it’s gone. That idea was dismissed by government as it is not in favor of chopping it off, they would rather do something else. But in any case behind everything else it looks like there is an attempt to control Grameen Bank. And the law that we started out with makes it very clear that it should be guided by its own board. A board is ultimate decision-making body. But the present government somehow didn’t like that, so they want to intervene into the activities of Grameen Bank. And that’s why all these 19 pieces and all control mechanisms, and changing the law, amending the law to intrude into the bank – all these things came about. And this seems to be not very friendly to the bank itself and any action that is being taken, and nobody in the world will say that it is in the interest of the bank or the poor people. I’m very worried about it and I try to draw attention of everybody, every sane person that, look, you have to stop that, this is a great institution, this brings so much good for the people, particularly poor families and poor women in the world. That has given so much empowerment to the women in Bangladesh and that is becoming a global phenomenon, bringing the same thing in many, many countries. 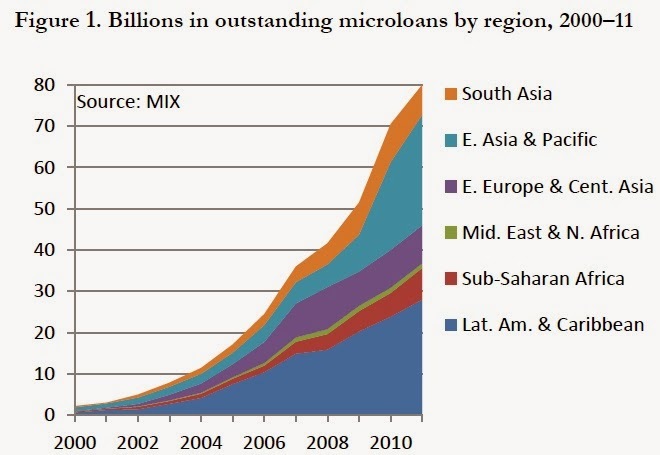 Almost every single country, including Russia, has microcredit programs. So, today, to go back to the origin of that whole idea, Grameen Bank, and to harm it – it will be totally painful and unacceptable." "All the allegations that you have listed, again and again have been demonstrated, we sent all the information to the public to make sure that they understand it’s all baseless, there is no ground for it. For example, the case of tax evasion, it was decided in the cabinet meeting that my tax information should be examined by the tax authorities and that report should be submitted to the cabinet itself, the cabinet of ministers. They did that, they said we’ve investigated every detail, so Professor Yunus has tax returns and if he did everything correctly, we have no problem, we have not missed any single penny in taxes, so we have no problem with that. But the cabinet was not satisfied with that report, they sent it back again to make more inquires so that they can find something else." "We work it all over Bangladesh, every single village in Bangladesh has access to domain bank microcredit program, so we have borrowers all around the country, we have 8.5 million borrowers, 97 percent of them are women. They are all connected within our system. I should mention that the bank is owned by the borrower, so the borrower is not somebody outside this; she is in control, she is the borrower and she is the owner, and she sends a representative to sit in the board, whoever is making a decision is actually her representative and a borrower like her. So, it’s not something in some big banks when somebody came and give you a loan, and they don’t know you and you don’t know them, it’s not like that, it’s a family kind of thing, it’s 8.5 million women’s family. So, we work at it as a kind of organization to be with them and for them." For an academic take on microfinance, a useful starting point is "Microﬁnance Meets the Market"
"The original idea of microcredit focused on funding small, capital-starved businesses. Several decades of experience has shown that the demand for loans extends well beyond customers running businesses. Even customers with small businesses often seek loans for other needs, like paying for school fees or coping with health emergencies. ... [H]half of recent loans taken by poor households in Indonesia were used for purposes unrelated to business. ... The future will likely see a movement toward new loan products for general purposes, new savings products, and better ways to reduce risks. Poor and low-income households typically devote much energy to juggling complicated financial lives, and improving their basic financial capabilities can be greatly beneficial to them, even if it does not lead to wide-scale poverty reduction or national-level economic growth." 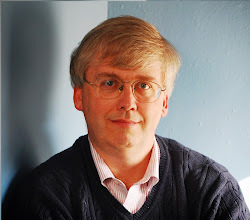 Douglas Clement has yet another in his string of excellent interviews, this one with Neil Wallace, in the December 2013 issue of The Region, published by the Federal Reserve Bank of Minneapolis. In much of the interview, Wallace discusses his views on the underpinnings and functions of money. The headings that follow are my own; the comments are from Wallace. “Money is memory” is a better idea. It leads you to think about various kinds of payment instruments in terms of the kind of informational structure that supports them. The money that is the best current counterpart to the “money is memory” idea is currency. You don’t need much of an informational network for currency; in fact, you probably don’t need any, except for worrying about counterfeiting. When you use a credit card, you’re issued a loan. Why are you able to receive one? Because there’s an informational network behind your card. Your bank is actually guaranteeing your credit payment up to probably some large amount, as large as you mostly use. And they’re doing that because they know something about you. But giving them that flexibility in, say, the form of a demand deposit, allowing them to withdraw whenever they want, means they might also withdraw not just when they want to spend but because they’re worried about the [safety of that financial] institution. ...[I]n the model, the realization of the spending desire is private information. So, as an example, when you go up to the bank window to make a withdrawal, it’s not written on your forehead whether you genuinely want to make a payment or whether you’re worried about the solvency of the bank. That information is private. 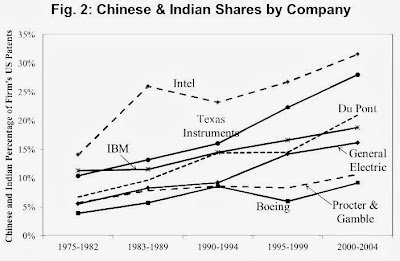 Then a second element in the model is that the technology is such that longer-term investments have bigger payoffs than short-term investments. 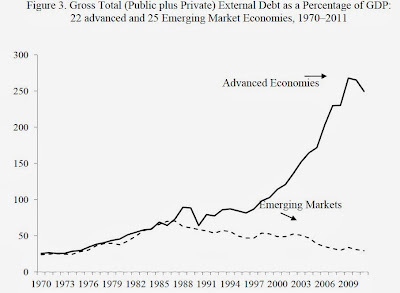 ... That’s why it’s socially a good idea for those deposits to be used to finance this long-term investment. It’s like wine, if you leave it in, it’s going to turn good. If you withdraw it quickly, it’s going to be just the grape juice that you started out with. The literature on banking has always been—like that on money—a troublesome literature. This goes back to economists’ feelings that the general competitive model, often labeled the Arrow-Debreu model, is the main model in economics. It’s very general. We don’t need to have a special theory of production for bookcases and a special theory for bottled water. Today, of course, Malthus is best-remembered for his "Essay on the Principle of Population," and its argument that population grows geometrically, while food supply runs into diminishing returns, and so near-starvation was inevitable. Ricardo is best-remembered for his rigorous exposition of the principle of comparative advantage, which remains one of the most powerful non-obvious insights that economics can offer. But in their time, Malthus was what we would today call a Keynesian and Ricardo was what we might call a neoclassical economist. Indeed, John Maynard Keynes in the General Theory gives generous credit to Malthus as his predecessor for having formulated a theory of "gluts," or what we would today call recessions. Malthus and Ricardo apparently met around 1813 in a dispute over the "corn laws," a protectionist policy of import tariffs and export subsidies that sought to benefit English farmers. Ricardo was opposed; Malthus was in favor. But in arguing it out, they jointly developed a theory of rent; a theory of how national income would be distributed among workers, merchants, and landed gentry; and thus a basis for growth theory. They wrote copious letters to each other and published pamphlets. Dorfman writes: "They labored together to understand the economic consequences of the Corn Laws. Their discussions led them to a deeper understanding of economics than anyone had attained before. But they could not agree on the substantive matter of policy." "They were still at it on August 31, 1823, when Ricardo was beginning to suffer severe headaches from an abscess on his brain. On that day, Ricardo wrote Malthus a long letter, which began, "I have only a few words more to say on the subject of value, and I have done." After about two pages of careful reasoning, he concluded, "And now, my dear Malthus, I have done. Like other disputants, after much discussion we each retain our own opinions. These discussions, however, never influence our friendship; I could not like you more than I do if you agreed in opinion with me. Pray give Mrs. Ricardo's and my kind regards to Mrs. Malthus. Yours truly ..."
"Two weeks later, Ricardo was dead. At his funeral, Malthus is reported to have said, "I never loved anybody out of my own family so much. Our interchange of opinions was so unreserved, and the object after which we were both enquiring was so entirely the truth and nothing else, that I cannot but think we sooner or later must have agreed." Malthus and Ricardo laid down some challenges worth considering in one's own life. Do you go the extra distance in at least a spirit of collegiality, to explain your views? Do you try just as hard to hear validity in the criticisms of others as you do to explaining your own views? Do you leave open the possibility that your own views are only an imperfect approximation of truth, just as the views of others are an imperfect approximation of truth, so that perhaps you are searching for answers together, rather than opposing each other? Can you completely disagree but still be friends? "It is as though each served as the anvil for the other's hammer, and their ideas were hammered out in their efforts to persuade each other. They were two men obsessed by a common enthusiasm, tirelessly pursuing a common goal: to understand the economy. But they did not share a common vision of the good society and thus were condemned to wrestle interminably, though remarkably fruitfully, over the roles of the social classes. Their struggles to convey to each other their views of the forces that drove their economy are an inspiring case study in both the difficulty and the possibility of human communication. These two friends, sustained by enormous affection and respect for one another, never could nullify the differences in preconception and mental style that separated them, but still could help each other attain a deeper understanding of their economy than anyone had achieved before. To do this required invincible faith in each other's candor and open-mindedness, great patience, inexhaustible good will, and unflagging civility." In the 21st century, it's useful to remember that social media snarkiness and flame wars are a choice, and other choices are possible. Claudia Goldin delivered the Presidential Address at the American Economic Association meetings last week entitled ""A Grand Gender Convergence: Its Last Chapter." 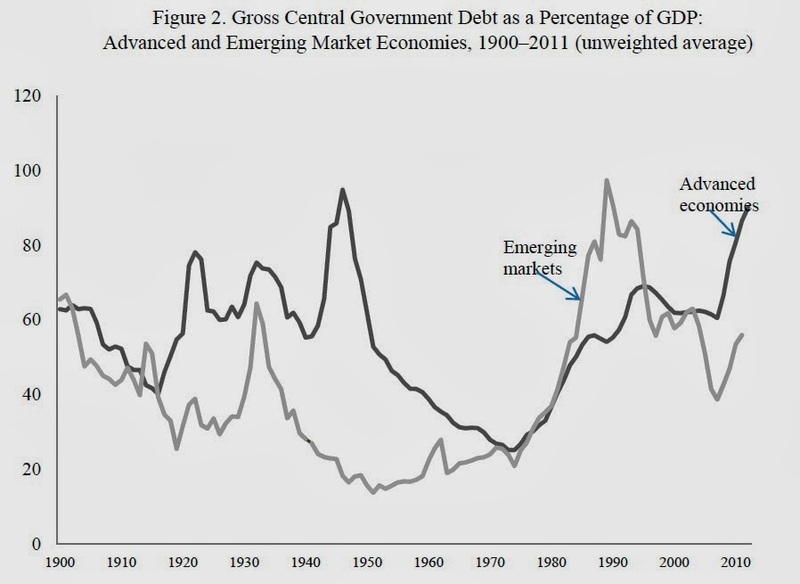 The talk is traditionally published in a few months in the American Economic Review. But a pre-copy-edited final draft version is available at Goldin's website here. more like men, the human capital part of the wage difference has been squeezed out. What remains is largely how firms reward individuals who differ in their desire for various amenities. These amenities are various aspects of workplace flexibility. Workplace flexibility is a complicated, multidimensional concept. The term includes the number of hours to be worked and also the need to work particular hours, to be “on call,” give “face time,” be around for clients, be present for group meetings and so forth." The typical pattern here is that women have a fairly small gender wage gap when they first start their careers. However, as women reach their child-bearing and child-raising years, the gender wage gap opens up. Women who don't have children experience a much smaller gender wage gap. In addition, Goldin shows that this pattern commonly exists within many different occupations, although the size of the wage gap does vary across occupations. She writes: "The main takeaway is that what is going on within occupations—even when there are 469 of them as in the case of the Census and ACS [data]—is far more important to the gender gap in earnings than is the distribution of men and women by occupations. ... If earnings gaps within occupations are more important than the distribution of individuals by occupations then looking at specific occupations should provide further evidence on how to equalize earnings by gender. Furthermore, it means that changing the gender mix of occupations will not do the trick." 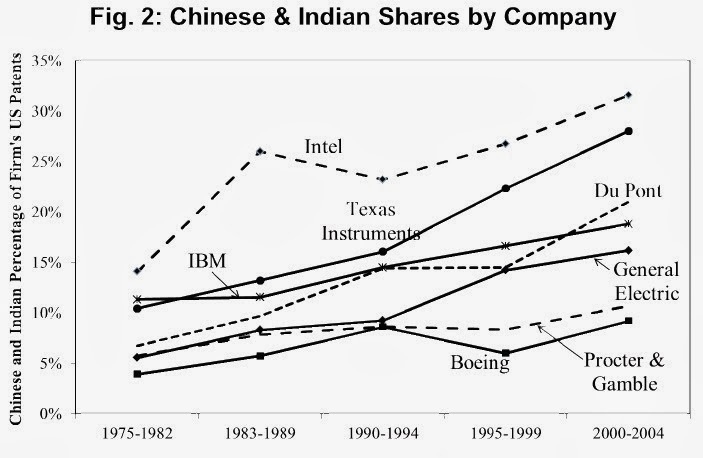 Here's a figure showing the overall pattern. Each of the lines is a birth year for women. The horizontal axis shows the age of the woman. 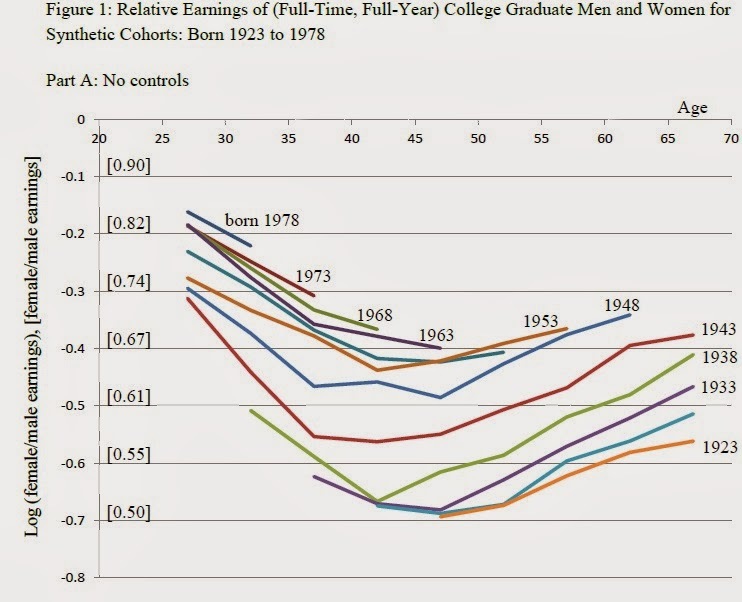 The vertical axis shows the gender wage gap at that age. The vertical axis is measured on a logarithmic scale, and for those who aren't familiar with that scale, Goldin inserts the percentage wage gap in brackets. You can see that the lines for women born more recently are higher on the graph, which shows that the gender wage gap is diminishing over time. You can also see that from about age 25 up to about age 40, the gender wage gap expands, whereas after about age 45, it contracts. Goldin looks at data on wages by gender across these 469 occupational categories. She finds some overall patterns, like the gender gaps tend to be bigger in business occupations and smaller in technology and science occupations. She focuses on whether an occupation is "linear," which basically means that if someone works 50% more hours than someone else, they earn 50% more. The alternative is whether an occupation is "non-linear," which means that if someone works 50% more hours than someone else, they earn a substantial amount more than 50% more. Careers in business and law tend to be nonlinear: that is, those who work very long hours can make extremely high rewards, and those who work 30 hours per week earn considerably less than half as much as those who work 60 or more hours per week. "Pharmacists have become better substitutes for each other with the increased standardization of procedures and drugs. The extensive use of computer systems that track clients across pharmacies, insurance companies and physicians mean that any licensed pharmacist knows a client’s needs as well as any other. If a pharmacist is assisting a customer and takes a break, another can seamlessly step in. In consequence, there is little change in productivity for short-hour workers and for those with labor force breaks. ... [T]here is less need for interdependent teams in pharmacy and for extensive contact with other employees. Female pharmacists have fairly high labor force participation rates and only a small fraction have substantial interruptions from employment. Rather than taking off time, female pharmacists with children go on part-time schedules. In fact, more than 40 percent of female pharmacists with children work part-time from the time they are in their early thirties to about 50 years old. Male pharmacists work around 45 hours a week, about nine hours more than the average female pharmacist. The position of pharmacist became among the most egalitarian of all professions today." "The last chapter must be concerned with how worker time is allocated, used and remunerated and it must involve a reduction in the dependence of remuneration on particular segments of time. It must involve greater independence and autonomy for workers and the ability of workers to substitute seamlessly for each other. Flexibility at work has become a code word to mean shorter hours. It also means temporal flexibility such that total hours worked are the same. Flexibility is of little value, however, if it comes as a high price. There are many occupations that have moved in the direction of less costly flexibility. ... Some changes have occurred organically often due to economies of scale (as in the cases of physicians, pharmacists and veterinarians), some changes have been prompted by pressure on the part of employees (as in the case of various physician specialties such as pediatricians), and yet other changes have occurred because of a desire to reduce costs. What the last chapter must contain for gender equality is not a zero sum game in which women gain and men lose. Many workers will benefit from greater flexibility, although those who do not value the amenity will likely lose from its lower price. The rapidly growing sectors of the economy and newer industries and occupations, such as those in health and information technologies, appear to be moving in the direction of more flexibility and greater linearity of earnings with respect to time worked. The last chapter needs much more of that."